Labour remains divided over whether to try and stay in the EU’s single market, its Brexit spokesman has said. 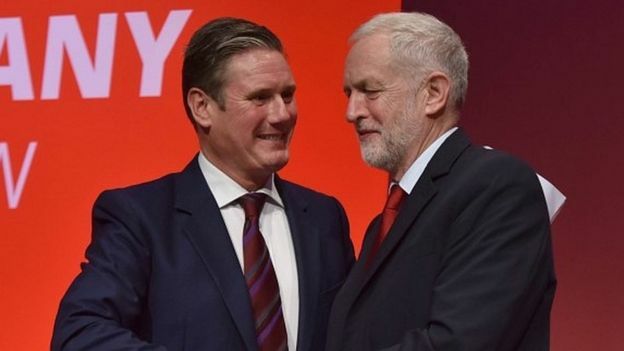 Sir Keir Starmer said the party’s MPs had “different views” as he set out a series of compromise proposals on retaining access to the single market. He also confirmed that Labour would not back a vote next week on keeping the UK in the single market through membership of the European Economic Area. The UK is due to leave the EU in March next year, after the 2016 referendum. Much of the focus at the moment is on what sort of relations the UK will have with the European Union after Brexit. The Conservative government has said that the UK will leave the EU single market and the EU customs union and will no longer be subject to the European Court of Justice, but wants to agree a deal providing as “frictionless” trade as possible. The EU says that to have the benefits of the single market the UK must be subject to its rules and also agree to the free movement of people – the latter is something which both main UK parties have currently ruled out. The government’s EU Withdrawal Bill (which puts all EU law into UK law to prevent chaos on Brexit day) has been amended by the House of Lords to back a customs union being agreed with the EU, and also for the UK to join the European Economic Area, which would mean it being a member of the single market, like Norway. MPs are due to vote on these and a series of other Lords amendments which are also at odds with the government’s position. Many Labour MPs and peers had hoped Jeremy Corbyn would say the party would vote for staying in the European Economic Area. But Labour has now said it will not support that amendment, instead setting out compromise plans for “full access” to the single market.